September 5, 1880 – A Chicago Daily Tribune editorial issues praise for an expanding lakefront “as a beautiful breathing-spot for the people” [Chicago Daily Tribune, September 5, 1880] after which it issues a warning. The paper first observes, “The debris from the great fires of ’71-‘4 furnished the material to fill up the basin between the Illinois Central Railway and the old breakwater, and, after various vicissitudes, the space has been leveled off, with walks and grass plots it affords an inviting retreat on sultry evenings for all classes, the working people especially finding there much needed rest and recreation. It is hoped in the not distant future that stately maples and elms will replace the starveling poles that now disgrace it, and make it one of the most beautiful, as it is the most inviting, resort that can be found in any city in the country.” Disrupting the process of beautification, though, is a proposal to make the area a parade ground for the military. “No one will accuse THE TRIBUNE of opposing anything that can contribute to the comfort and efficiency of our military organizations,” the editorial ends, “but the use of the park for this purposes is entirely unnecessary … by common consent base-ball has usurped a part of this north end of the park (the organization that eventually would become the Chicago Cubs began its life, playing in an area that is now occupied by the peristyle on the southeast corner of Randolph Street and Michigan Avenue) … A strong remonstrance has been prepared, and it is hoped the Council will adopt it. Let the park be kept forever for the people. 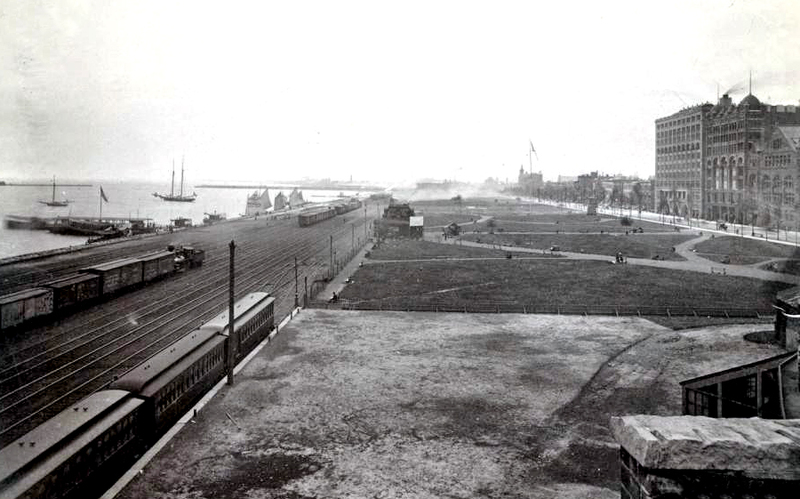 They need it, and it is their right that they should have it.” The photo above shows the park, looking south, about ten years after the editorial appeared. September 5, 1931 – The general manager of the Union Station Company, O. H. Frick, announces that work will soon begin on a $2,000,000 powerhouse that will supply heat to the new post office building, Union Station, and other railroad property along the river. The new structure will sit midway between Taylor Street and Roosevelt Road on the west bank of the river. 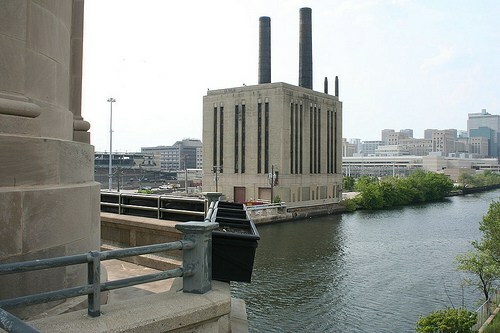 The new building is necessary because the present Union Station heating plant sits on the site of the new post office, currently under construction. Graham, Anderson, Probst & White, the same architectural firm that designed Union Station and the new post office, will also design the power house. The specifications for the new structure are impressive, according to Frick. He says, “The first unit will have four 1,600 horse power boilers, normal rating, with a maximum rating of 4,000 horse power each. Its capacity will be 16,000 horse power. The maximum length of the distributing system will be about one mile and will use both overhead and underground pipe systems, thoroughly insulated to reduce condensation losses.” The Union Station Company, jointly owned by the Pennsylvania, Burlington, and Milwaukee railroads, projects the cost of the powerhouse at $2,000,000.